Eczema herpeticum, also known as a form of Kaposi varicelliform eruption caused by viral infection, usually with the herpes simplex virus (HSV), is an extensive cutaneous vesicular eruption that arises from pre-existing skin disease, usually atopic dermatitis (AD). Children with AD have a higher risk of developing eczema herpeticum, in which HSV type 1 (HSV-1) is the most common pathogen. Eczema herpeticum can be severe, progressing to disseminated infection and death if untreated.1 Bacterial superinfection and bacteremia are usually the complications that cause mortality. We present a case in which eczema herpeticum was misdiagnosed as impetigo during a patient’s initial treatment. Detailed history taking and characteristic cutaneous findings can help clinicians make an accurate diagnosis. A 4-year-old girl whose medical history was remarkable for chronic AD since infancy experienced fever, chills, and rhinorrhea for 6 days. Multiple chronic eczematous lesions with erosions and excoriations were noted over the frontal region and the cheeks. She was taken to a local clinic, where impetigo and acute upper respiratory tract infection were initially considered. A topical antibiotic ointment and other medications were prescribed to relieve the symptoms, but the fever persisted. Two days later, she experienced general malaise, poor activity, periorbital swelling, and purulent discharge from the cutaneous lesions; therefore, she was brought to our pediatric outpatient department for evaluation. She had received vaccination as scheduled but had not received vaccination in the past 6 months. On initial examination, the patient had a fever, with a temperature of 38.6°C; a heart rate of 124 beats/min; and a respiratory rate of 24 breaths/min. Multiple grouped punched-out ulcers were noted with local dissemination over the frontal, periorbital, and perioral areas and cheeks (Figure 1). Furthermore, secondary impetiginization was observed around the mouth. However, no palpable lymphadenopathy was found. The patient’s laboratory studies revealed a white blood cell count of 8 × 109/L, with 48.9% neutrophils, 38% lymphocytes, and 12% monocytes; a hemoglobin level of 114 g/L; a platelet count of 275 × 109/L; and a C-reactive protein level of 5.43 nmol/L. We prescribed empiric antibiotics with cefazolin intravenously at an initial dose of 100 mg/kg daily; however, the spiky fever persisted for 2 days, so we changed the antibiotics to 500 mg of oxacillin intravenously every 6 hours. Because the wound discharge culture specimens grew methicillin-resistant Staphylococcus aureus, we shifted the antibiotics to vancomycin (40 mg/kg daily) the next day, but the fever did not subside after 3 days. 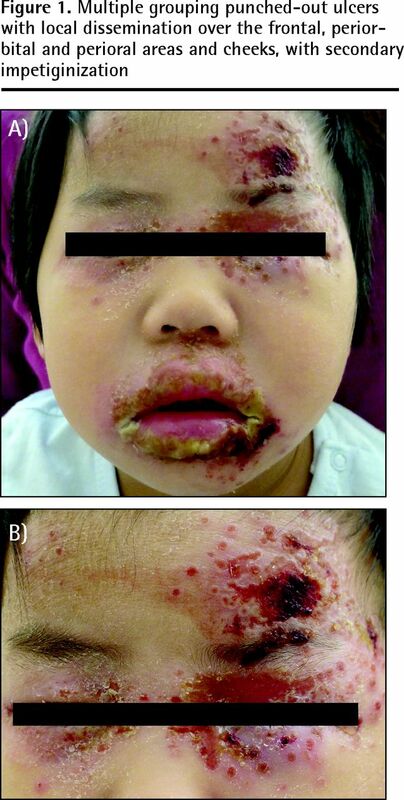 A dermatologist consultant diagnosed eczema herpeticum with secondary impetiginization, which was confirmed by a Tzanck test for multinucleated giant cells (Figure 2) and virus isolation (HSV-1). The patient was prescribed systemic acyclovir. An ophthalmologist diagnosed nonspecific conjunctivitis without herpetic keratitis. After administering 250 mg of acyclovir intravenously every 8 hours, the fever subsided, and the girl’s symptoms improved gradually. Atopic dermatitis is a chronic, pruritic, eczematous skin condition that affects approximately 15% to 20% of children in developed countries.2 It is caused by multiple factors, including genetic, neuroendocrine, immune, and environmental factors; infection; and defective epidermal barrier.3 The involved skin is easily infected by bacteria and viruses owing to the disruption of the epidermal barrier function and the innate immune system. Just like other HSV infections, eczema herpeticum can recur. Patients might present with localized HSV infection in previously involved areas. Secondary bacterial infection, mostly due to S aureus, often occurs because of the inflammatory and extensive nature of the process.7 Therefore, the underlying viral pathogenesis might be misdiagnosed. Early diagnosis of eczema herpeticum can prevent or minimize complications. The criterion standard for diagnosis of HSV infection is virus culture. In our case, the final virus isolation confirmed our diagnosis. The quality of the swab and culture techniques affect the specificity and sensitivity of virus culture. 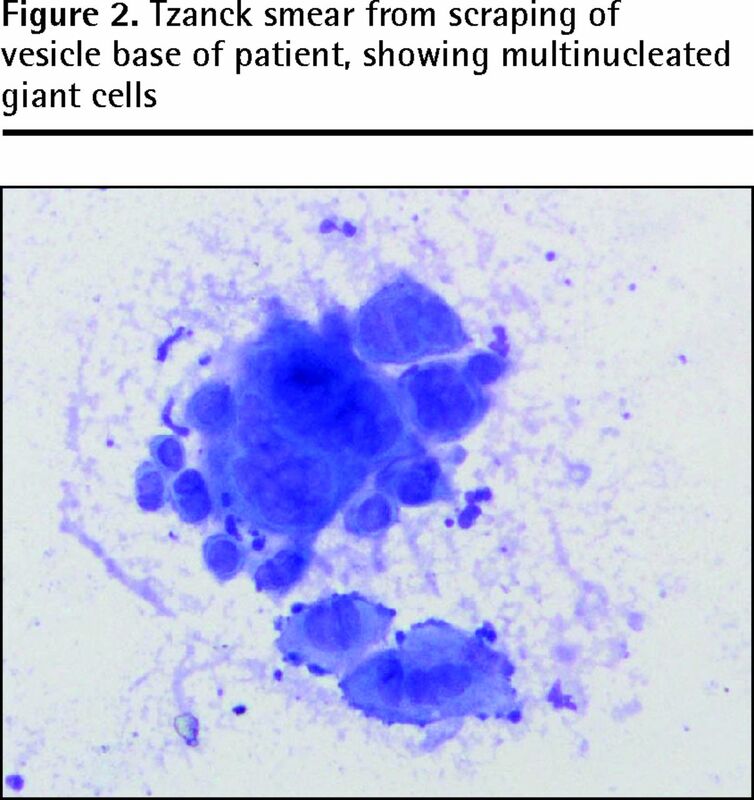 The microscopic finding of a Tzanck test for multinucleated giant cells can confirm a herpes virus infection and provide rapid diagnosis. Although it is a very easy and quick bedside test, its specificity and sensitivity depend on the operator.5 Direct fluorescence antigen testing is rapid and inexpensive. A fluorescently tagged antibody can detect an HSV antigen and distinguish between HSV-1 and HSV-2 infections. The clinical manifestation of eczema herpeticum is characteristic; however, it can be confused with impetigo, eczema vaccinatum, and primary varicella infection7 (Table 11,2,5,8). Eczema herpeticum with secondary staphylococcal infection is a common occurrence that might be misdiagnosed as impetigo, leading to delay in treatment with acyclovir. Misdiagnosis of eczema herpeticum can lead to severe complications, such as herpetic keratitis and death. In an immunocompromised patient, the mortality rate is reported to be as high as 6% to 10% and even 50%.9 Clinicians should be aware that timely diagnosis and treatment of eczema herpeticum are very important to avoid severe complications. Timely and accurate diagnosis of eczema herpeticum at initial presentation is very important. In the case of our patient, eczema herpeticum was initially misdiagnosed as impetigo. Antibiotic treatment is insufficient, and progressive eczema herpeticum might cause blindness and even death. Feye et al11 presented a case of a 38-year-old man who developed a burning vesicular rash and a chronic skin condition over his back and chest. He also complained of a severe burning sensation and watering in both eyes. He received misdirected corticosteroid therapy for “exacerbation of AD.” This resulted in progression of his ocular HSV-1 infection and bilateral keratitis. At this juncture, specific treatment with intravenous and topical ophthalmic acyclovir resulted in regression of eczema herpeticum and keratitis. Feye and colleagues11 emphasized that this condition was a medical emergency and that physicians should recognize such diseases early to avoid ophthalmologic and life-threatening complications. Atopic dermatitis is the most common diagnosis in the outpatient department for pediatric dermatology. Impaired protective skin function facilitates HSV infection. Patients should be carefully examined for secondary herpes virus infection owing to the high mortality rates associated with it. Secondary bacterial infection is a common complication. Early awareness of eczema herpeticum and prescription of systemic antiviral medication are very important. Consultation with an ophthalmologist is also required for diagnosing herpes keratitis. In chronic dermatitis, physicians should be aware that grouped and locally disseminated papulovesicular lesions with punched-out ulcers indicate the possibility of eczema herpeticum. Eczema herpeticum, an extensive and pronounced vesicular and ulcerative eruption that appears with an underlying chronic skin disease, leads to potential blindness and even mortality. Endogenous and exogenous factors contribute to the defective epidermal defence barrier function in patients with atopic dermatitis, which makes patients more susceptible to cutaneous infection. If the lesions involve periorbital areas, consultation with an ophthalmologist is required. Early diagnosis of eczema herpeticum and immediate systemic antiviral therapy can minimize the severe and lethal complications. L’eczéma herpeticum, une éruption vésiculeuse et ulcérative vaste et prononcée qui apparaît avec une maladie chronique sous-jacente de la peau, peut entraîner une éventuelle cécité et même le décès. Des facteurs endogènes et exogènes contribuent au fonctionnement déficient de la barrière épidermique chez les patients atteints de dermatite atopique, rendant les patients plus vulnérables aux infections cutanées. Si les lésions touchent les régions autour des cavités orbitales, il faut consulter un ophtalmologiste. Un diagnostic précoce de l’eczéma herpeticum et une thérapie antivirale systémique immédiate peuvent minimiser les complications graves et mortelles. , editors. Nelson textbook of pediatrics. 18th ed. Philadelphia, PA: Saunders Elsevier; 2007.
. Eczema and infection. Pediatr Infect Dis J 2008;27(6):551-2.
. Consensus conference on pediatric atopic dermatitis. J Am Acad Dermatol 2003;49(6):1088-95.
. Viral infections in atopic dermatitis: pathogenic aspects and clinical management. J Allergy Clin Immunol 2003;112(4):667-74.
, editors. Conn’s current therapy. Philadelphia, PA: Saunders Elsevier; 2011.
. Eczema herpeticum: making the diagnosis in the emergency department. J Emerg Med 2011;40(2):167-9.
. Diagnosis and treatment of impetigo. Am Fam Physician 2007;75(6):859-64.
. Fitzpatrick’s color atlas and synopsis of clinical dermatology. 6th ed. New York, NY: McGraw-Hill; 2009.
, editor. Clinical dermatology. A color guide to diagnosis and therapy. 5th ed. Philadelphia, PA: Mosby Elsevier; 2009.
. Exacerbation of atopic dermatitis in the emergency department. Eur J Emerg Med 2004;11(6):360-2.